Bandera, chancle, coyol, Indian shot plant, platanillo or saka siri. Will grow to 1.5 to 2m by 50cm. Moderate, will reach full height in 2 to 5 years. Flowers from August to October. Foliage display starts a bit earlier than this. Happy in any soil types. 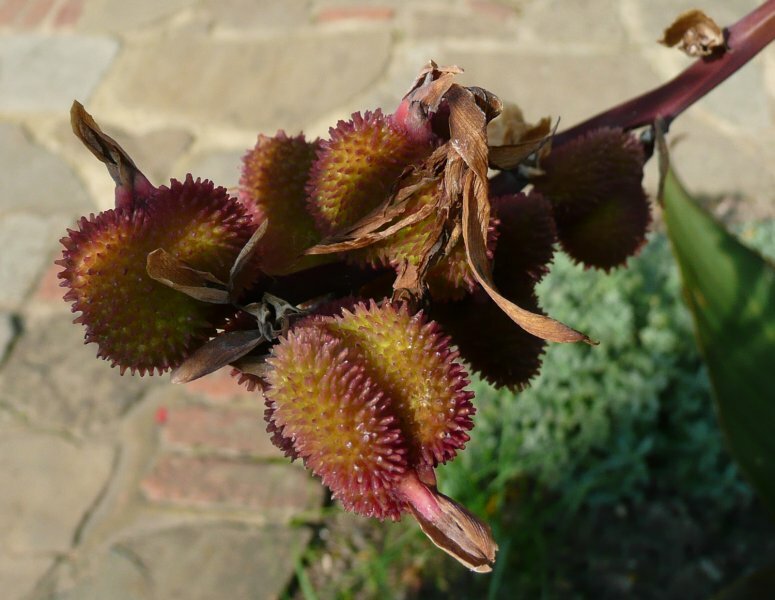 Grow it in a sheltered spot so that you don’t risk the leaves getting tattered or the stems snapping. 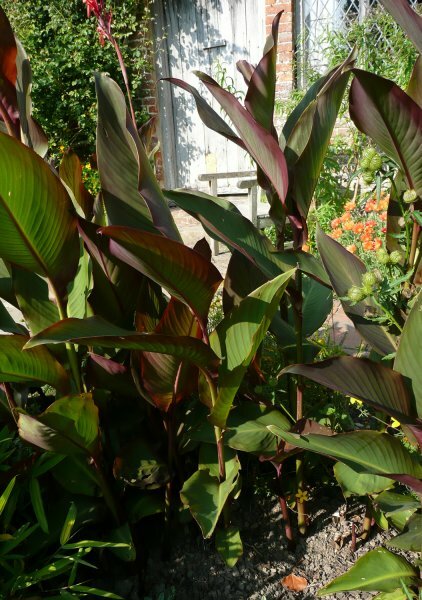 The large, luscious foliage originating from single stems is dark green with purple-red markings, giving this plant a tropical feel. These are then followed by bright red or orange flowers and spiky seedheads. 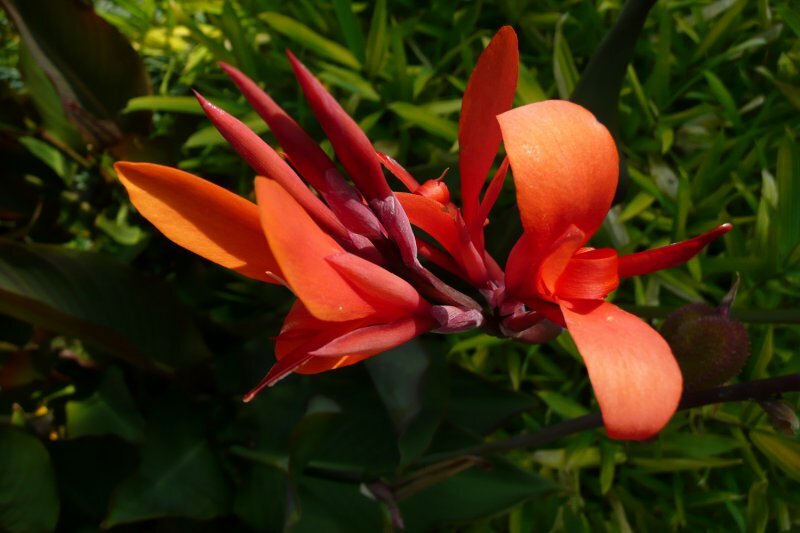 Tropical plantings, in borders or containers. Lift the rhizomes (if in the soil) and bring indoors before the first frosts. Keep the rhizomes in barely moist compost in a cool, frost free place over winter. A garage or frost-free greenhouse would be ideal. Plant out again in the late spring – use fresh compost and gradually increase the watering frequency to ease it back into life. Alternatively apply appropriate winter protection for established plants which need to stay outside over winter. No pruning required. Cut back any remaining vegetation prior to lifting the rhizomes. The easiest method is to divide the rhizomes in spring. The resulting plants should be grown on at 16˚C for flowers in the same season. 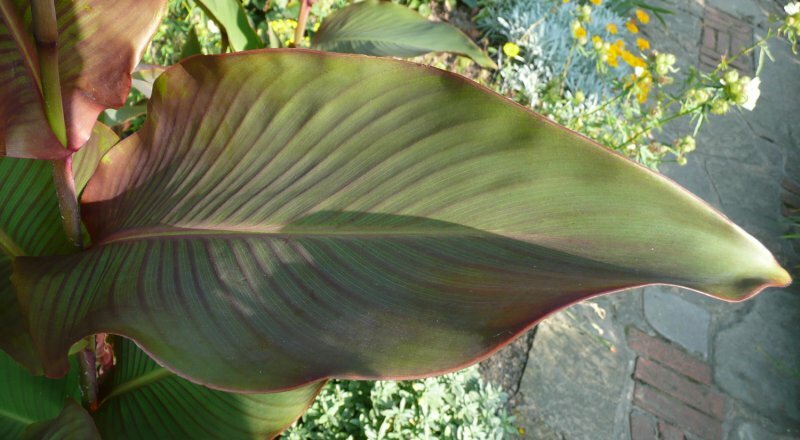 Alternatively, cannas can be grown from seed. Collect or purchase seeds and file them slightly or soak them in hot water to break their dormancy. Then sow the seeds at 21˚C. The resulting plants will flower in their second year. Caterpillars and slugs can be attracted to the lush foliage. If growing in a greenhouse, two spotted spider mites can also be a problem. One of this plant’s common names is ‘Indian shot’ – this is because the small, round black seeds resemble shotgun pellets. The seeds are often used for jewellery or in rattles. 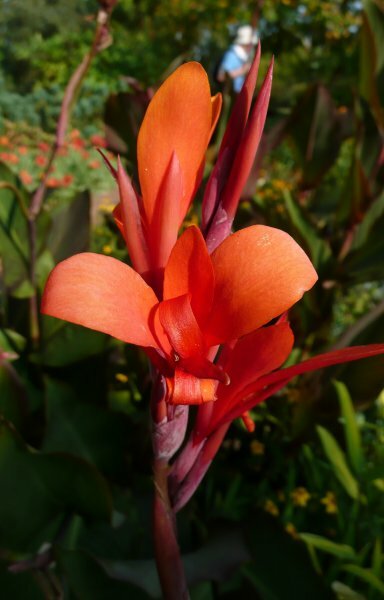 The name Canna originates from the Celtic word for a cane or reed. The species is ‘indica’ relating to the fact that it was originally introduced to Europe from the West Indies.